Our favorite comic is up for an Eisner Award! 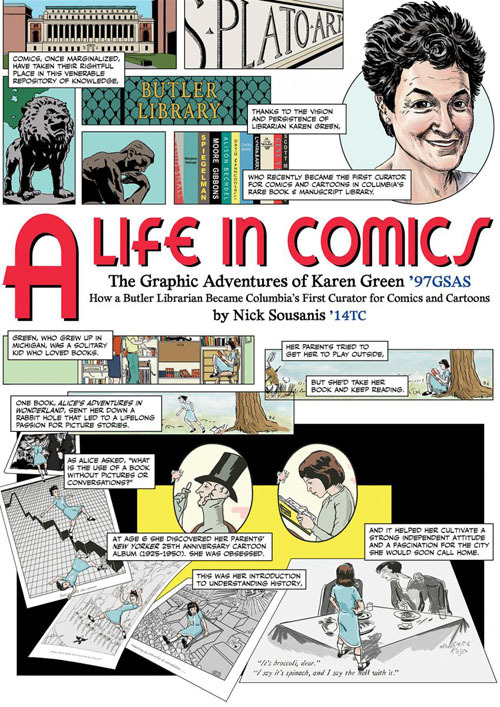 “A Life in Comics,” published in the Summer 2017 issue of Columbia Magazine, was created by cartoonist and Teachers College alum Nick Sousanis and traces the unconventional path taken by librarian Karen Green which led to an unconventional career as Columbia Libraries’ first-ever Curator for Comics & Cartoons. The illustrated feature is nominated in the “Best Short Story” category of the Eisner Awards, an annual prize given for creative excellence in American comics. The winners are decided by professionals in the comic industry and will be announced at the 2018 Comic-Con International in San Diego, CA, in mid-July. For more on Karen’s work in the Libraries as both Curator and Librarian for Ancient & Medieval History, check out our own profile of her day-to-day in Butler Library and her offbeat collections. Congrats to Columbia Magazine, Nick, and Karen on their well-deserved recognition! This entry was posted in News and tagged 2018 Comic-Con, Butler Library, cartoons, Columbia Magazine, Comic-Con International, comics, Eisner Awards, Karen Green, Nick Sousanis on April 27, 2018 by al3655.